Much of the garden is resting. Hibernating. Simplified. Winter is the time to appreciate and admire red and golden trunks, twigs, berries, and branches, as well as evergreen shrubs and trees that in other seasons provide background and structure. Below is a list of a few of our favorite winter beauties. All of these plants can be found growing at the Fair Oaks Horticulture Center. Blooming from late fall thru spring and just in time for Valentine’s day with abundant, brilliant rose-red, inch long, tubular heart shaped flowers is the Valentine emu bush, a charming eastern Australian native evergreen that delights visitors, including hummingbirds, to the heat lab area in the Ultra-WEL garden. 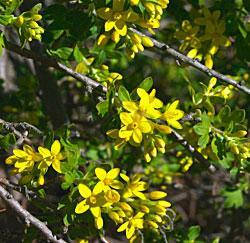 A mounding woody shrub that can reach 4 feet high by 5 feet, it is well suited to the low water use garden. Preferring full sun, it tolerates afternoon shade by reducing blooms. Not fussy about soil types, it does require good drainage. When not in bloom the narrow, purplish evergreen leaves make it a particularly handsome shrub which should be pruned back after blooming to prevent it from become leggy. Also, it has a reputation for being disease free. Once established it needs to be watered deeply just once or twice a month. 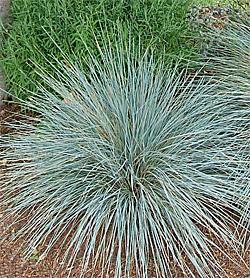 Blue oat grass sports spiky, steel-blue foliage. Native to the Western Mediterranean region, Helictotrichon sempervirens (hel-ik-toe-TRY-kon sem- per-VEER-enz) is a cool-season, evergreen grass that requires very little maintenance. Comb out unsightly foliage as needed and divide clumps every three years or so. Do not shear it back in late winter like you would other ornamental grasses. Planted in the front perennial garden area at the Fair Oaks Horticulture Center, our blue oat grass isn’t easily spotted from the path. The best vantage point is through the fence from the parking lot. The fountain-shaped clumps reach 2 feet in height and spread as much. 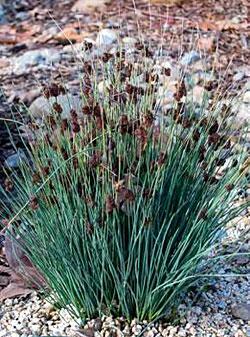 Blue oat grass sends up unremarkable, straw-colored flower heads in summer. Deadhead if you feel the flower heads detract from the showy foliage. It prefers fertile, amended soil and full sun, but appreciates some late afternoon shade where summers are hottest. Good drainage is essential. Blue oat grass performs best with weekly water, but is drought tolerant and can survive on one deep watering every two weeks. For additional water conservation, adjust the irrigation schedule just enough to prevent browning during periods of extreme heat. Cater to its minimal needs and it will look fantastic year-around. Blue oat grass is deer, pest and disease resistant and often planted in perennial borders, meadow-like areas and rock gardens. 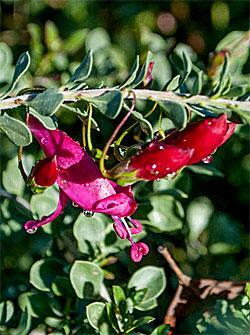 Mass plantings add a dramatic effect to gardens. 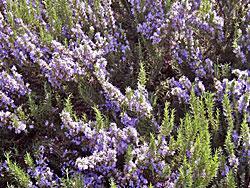 Companion plants include barberry, smoke bush, lavender, penstemon, nepeta, artemisia, lamb’s ear or any silver or purple-leaf plants. Grouping plants with similar water needs is always recommended. 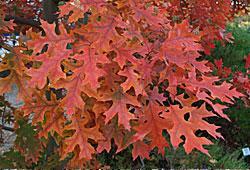 With brilliant golden scarlet fall foliage intensified by cool autumn nights that doesn’t drop until pushed off by new growth in the spring (a trait called marcescence) the scarlet oak is a favorite fall and winter accent plant. This attractive oak is native to the central and eastern United States where it is commonly found on sandy and gravelly upland ridges, slopes and occasionally on poorly drained soils. 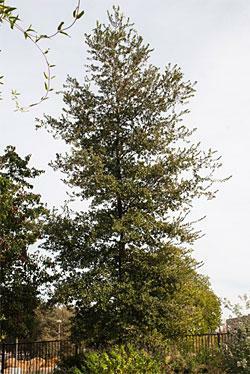 Growing to 80 feet tall to 50 feet wide from a youthful pyramidal shape to a mature broadly oval open crown it has been widely planted in urban areas of California as a street, parkway and lawn shade tree. 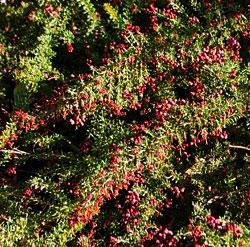 Tolerant of a wide variety of soils it prefers well drained, acidic soil and is susceptible to mistletoe infestations. It is among the trees offered to homeowners by the Sacramento Tree Foundation. Bright green foliage and cheerful yellow clustering 1 to 1½ inch blossoms adorn this winter blooming, summer-deciduous native currant and UC Davis Arboretum All-Star. 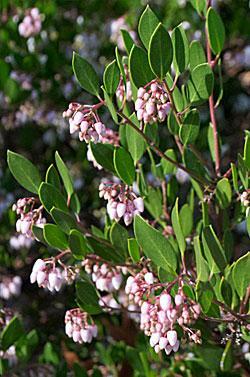 Sprawling up to 10 feet tall, the shrub naturally occurs on slopes below 2500 feet primarily in Southern California. The flowers and subsequent translucent yellow, orange, red and black berries attract birds, butterflies and beneficial insects. Preferring well drained soil, and suitable for planting under native oaks, it does well with some partial shade and light summer watering. Golden current spreads readily via rhizomes, layering stems and seedlings started from bird droppings and some pruning is needed to control the plant’s outreaching habit. It looks lovely as a companion to the concurrently blooming blue ceanothus. 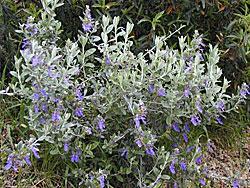 When the conversation drifts to edible landscaping, how can you not lavish love on Rosemary ‘Tuscan Blue’? 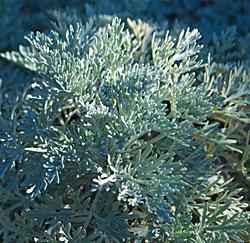 Tough, drought tolerant, and a dazzling, evergreen, ‘Tuscan Blue’ doubles as one of the best culinary herbs. ‘Tuscan Blue’ is a versatile choice for the garden with its upright growth and showy, lavender-blue flowers. It can be used as a foundation planting, a hedge, a screen, in containers or mixed borders, as a stand-alone stunner, a rock garden star and is a favorite for topiaries. It’s deer resistant and attracts butterflies, bees and birds. 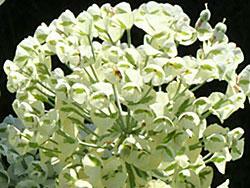 Blooms appear in spring, linger into summer and sporadic blooming can break out the remainder of the year. Growth is taller than its spread—5 to 6 feet tall, if you allow it, and 3 to 5 feet in width—but it is easily shape-pruned. Prune after the main bloom period. Plant in full-sun and well-drained soil. 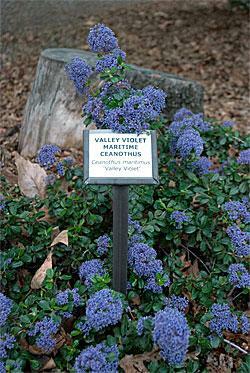 If soil conditions aren’t conducive to ‘Tuscan Blue,’ plant in a large container. Water regularly the first year, until established. 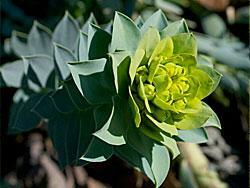 In winter, ‘Tuscan Blue’ can survive temperatures as low as 15 degrees. 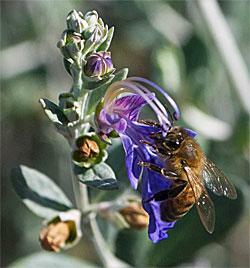 Common companion plantings include roses, Russian sage, thyme, yarrow, catmint and salvias. 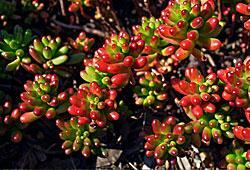 Sprawling 6 to 8 inch stems are set with leaves that look like jelly beans—green with reddish brown tips, often entirely bronze in sun. Leaves detach easily and root readily. Yellow flowers in spring. 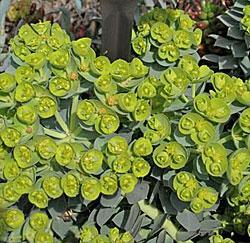 Great rock garden plant or small-space ground cover. 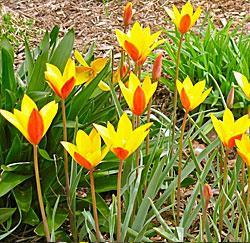 Clusiana species tulips, native to Afghanistan, Iran and Iraq, are the only tulip varieties that are recommended for Mediterranean garden naturalizing in our climate zone. (We are testing that recommendation in our garden.) 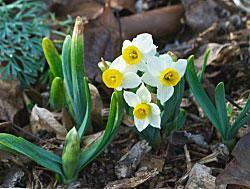 Growing 8 to 10 inches tall, they are among the first bulbs to bloom in early spring. 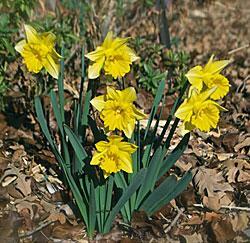 These bulbs should be planted in the fall at a depth equal to three times in their diameter and 2 feet apart. 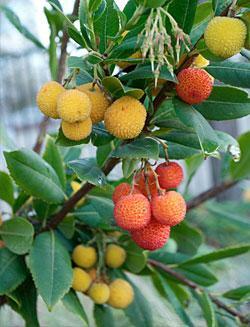 After spring blooming they should be fertilized and the foliage allowed to mature and die. Bulbs should not be disturbed the rest of the year. Bulbs may be difficult to find locally. The best sources are catalogs from specialty nurseries. A good overall bulb reference is the Pacific Bulb Society.